Details about Mary’s coming events are published on this page. Check back frequently to see these. Past events can be seen below. Mary’s play about Eva Braun and her sister Gretl “In the Light of Eva’s Shadow” was broadcast on Ireland’s national broadcasting service, RTE 1, on Sunday 21 May at 8pm. It’s an hour-long drama (originally written for 90 minutes) for two women’s voices and it’s now available for any director/actor who might be interested in producing it. Readings of this play took place in The Solstice Arts Centre, in Navan, Co Meath and Birr Theatre and Arts Centre, Birr, Co Offaly. The reading will be followed by a discussion around the subject of Joyce’s life, of treason, and of the applications of the death penalty. Mary Kenny will be present for Q&A. Mary’s play about Michael Collins and Winston Churchill’s private meeting in 1921, in the midst of the crucial Anglo-Irish Treaty negotiations which were the foundation of the Irish State. This drama is also studied as a peace and reconciliation text by some colleges in Northern Ireland. After a successful tour around the Irish provinces, the Sasta production of Mary’s play ‘Allegiance’ was in repertory performance in Ireland in January 2014 in Waterford and Carlow. Visit our Facebook or Twitter for latest news. In October 2012 in Kent, Mary gave a memoir-and-poetry performance called “Dorothy Parker Made Me a Feminist”: how the poetry of Dorothy Parker inspired the idea of women’s liberation. 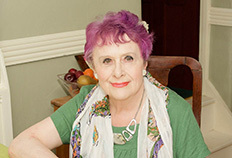 Mary will be at the Wexford Library, as the guest of The Thursday Club, in conversation about her most recent book. Mary will speak at the Belfast Book Festival, Crescent Arts Centre, Belfast. Mary will officially open the Ballymote Heritage Weekend, at Ballymote, Co Sligo, and will speak on the theme of “Poets and Priests of Ireland in the First World War”.